This chapter on data analysis presents two related techniques for analyzing consumer perceptions and preferences: multidimensional scaling (MDS) and conjoint analysis. We outline and iilustrate the steps involved in conducting MDS and discuss the relationships among MDS, factor analysis, and discriminant analysis. Then we describe conjoint analysis and present a step by step procedure for conducting it. We also provide brief coverage of hybrid conjoint models . Finally,we discuss the use of software in MDS and conjoint analysis. Help for running the SPSS and SAS programs used in this chapter is provided in four ways: (1) detailed step-by-step instructions are given later in the chapter, (2)you can download (from the Web site for this book) computerized demonstration movies illustrating these step-by-step instructions, (3) you can download screen captures with notes illustrating these step-by-step instructions, and (4) you can refer to the Study Guide and Technology Manual, a supplement that accompanies this book. In a survey. respondents were asked to rank-order all the possible pairs of 10 brands of soft drinks in terms of their similarity, These data were analyzed via multidimensional scaling and resulted in the following spatial representation of soft drinks. From other information obtained in the questionnaire. the horizontal axis was labeled as “Cola Flavor,” Tab was perceived to be the most cola flavored and 7-Up the least cola flavored. The vertical axis was labeled as “Dietness,” with Tab being perceived to be the most dietetic and Dr. Pepper the most nondietetic. Note that Pepsi and Coke Classic were perceived to be very similar. as indicated by their closeness in the perceptual map. 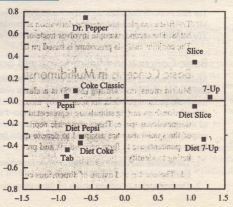 Close similarity was also perceived between 7-Up and Slice, Diet 7-Up and Diet Slice, and Tab, Diet Coke, and Diet Pepsi. Note that Dr. Pepper is perceived to be relatively dissimilar to the other brands. Such MDS maps are very useful in understanding the competitive structure of the soft drink market. The first example illustrates the derivation and use of perceptual maps, which lie at the heart of MDS. The second example involves trade-offs respondents make when evaluating alternatives. The conjoint analysis procedure is based on these trade-offs. • Image measurement. Compare the customers’ and non customers’ perceptions of the firm with the firm’s perceptions of itself and thus identify perceptual gaps. • Market segmentation. Position brands and consumers in the same space and thus identify groups of consumers with relatively homogeneous perceptions. • New product development. To look for gaps in the spatial map, which indicate potential opportunities for positioning new products. Also, to evaluate new product concepts and existing brands on a test basis to determine how consumers perceive the new concepts. The proportion of preferences for each new product is one indicator of its success. • Assessing advertising effectiveness. Spatial maps can be used to determine whether advertising has been successful in achieving the desired brand positioning. • Pricing analysis. Spatial maps developed with and without pricing information can be compared to determine the impact of pricing. • Channel decisions. Judgments on compatibility of brands with different retail outlets could lead to spatial maps useful for making channel decisions. • Attitude scale construction. MDS techniques can be used to develop the appropriate dimensional and configuration of the attitude space. Similarity judgments. Similarity judgments are ratings on all possible pairs of brands or other stimuli in terms of their similarity using a Likert-type scale. Preference rankings. Preference rankings are rank orderings of the brands or other stimuli from the most preferred to the least preferred. They are normally obtained from the respondents. Stress. This is a lack-of-fit measure; higher values of stress indicate poorer fits. R-square. R-square is a squared correlation index that indicates the proportion of variance of the optimally scaled data that can be accounted for by the MDS procedure. This is a goodness-of-fit measure. Spatial map. Perceived among brands or other stimuli are represented as geometric relationships among points in a multidimensional space called a spatial map. Coordinates. Coordinates indicate the positioning of a brand or a stimulus in a spatial map. Unfolding. The representation of both brands and respondents as points in the same space is referred to as unfolding. Figure 2J.J shows the steps in MDS. The researcher must formulate the MDS problem carefully because a variety of data may be used as input into MDS. The researcher must also determine an appropriate form in which data should be obtained and select an MDS procedure for analyzing the data. An important aspect of the solution involves determining the number of dimensions for the spatial map. Also, the axes of the map should be labeled and the derived configuration interpreted. Finally, the researcher must assess the quality of the results obtained,” We describe each of these steps, beginning with problem formulation. the resulting dimensions and configurations. At a minimum, eight brands or stimuli should be included so as to obtain a well-defined spatial map. Including more than 25 brands is likely to be cumbersome and may result in respondent fatigue. Multidimensional scaling will be illustrated in the context of obtaining a spatial map for IO toothpaste brands. These brands are Aqua-Fresh, Crest, Colgate, Aim, Gleem, Plus White, Ultra Brite, Close-Up, Pendent, and Sensory. Given the list of brands, the next question, then, is: How should we obtain data on these IO brands?